The drainage system was one of the most remarkable features of the Mature Harappan city. All the streets and lanes across neighbourhoods in Mohenjo-daro had drains. In addition there was also provision for managing wastewater inside the houses with vertical pipes in the walls that led to chutes opening on to the street, as well as drains from bathing floors that flowed towards the street drains. The street drains were typically made of baked brick, with special shaped bricks to form corners. The bricks were closely fitted and sealed with mud mortar. Gregory Possehl observes that over time, the same drains were reused by raising the walls with more bricks. He mentions one drain at the end of First Street in DK-G which was 2 meters deep in places. The drains were mostly covered and hidden underground. They were covered by a layer of baked bricked which was laid flat across the side walls of the drain. Wider drains were covered with limestone blocks.These were then covered with a layer of mud. Small settling pools and traps were built into the system of drainage to allow sediment and other material to collect while the water and smaller particles flowed away. These would be cleaned out periodically, and is attested to by "little heaps of greenish-gray sand that we frequently find alongside them". Wider drains were covered with extra long bricks, and for culverts, such as that at the Great Bath, a corbelled arch was used. See close-up image here , and where it cuts near the granary, here. 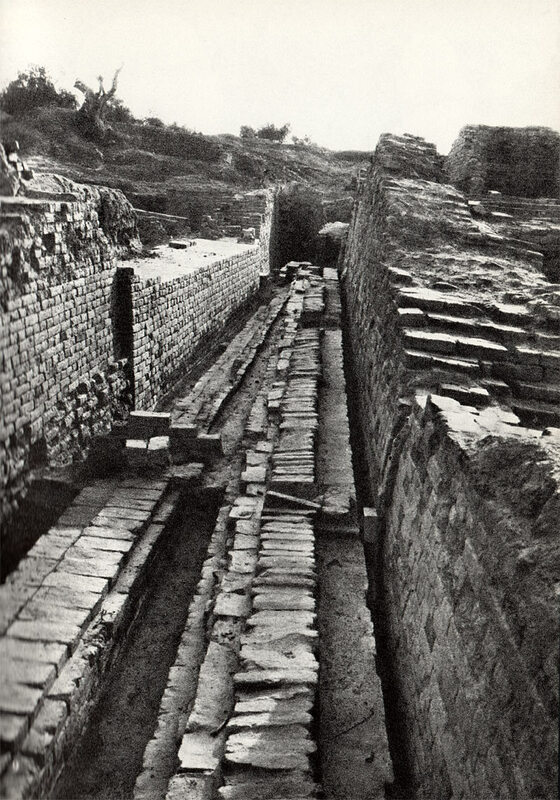 Mohenjo-daro Street with Drains (Plate 9, Sir Mortimer Wheeler, From Early India and Pakistan to Ashoka, London, Thames and Hudson 1959). Possehl, G. L. (2002). The Indus civilization: a contemporary perspective. Rowman Altamira.